1Department of Molecular Biology and Biotechnology, Pan African University, Institute for Basic Sciences, Technology and Innovation (PAUISTI–JKUAT), Nairobi, Kenya. 2Department of Biochemistry and Molecular Biology, Faculty of Health Sciences, Busitema University, Mbale Regional Referal Hospital, Uganda. 3Department of Biochemistry, Faculty of Agriculture, Cairo University, 12613 Giza, Egypt. 4Department of Biochemistry, Jomo Kenyatta University of Agriculture and Technology (JKUAT), Nairobi, Kenya. 5Department of Biochemistry, Faculty of Agriculture Research Park (FARP) and Faculty of Agriculture, Cairo University, 12613 Giza, Egypt. Background: Folk medicine has taken an important place especially in developing countries where limited health services are available. However, the absence of scientific evaluation of medicinal plants may cause serious adverse effects. Objective: To analyze the phytochemical composition of the ethanolic extracts of leaves of Annona muricata using gas chromatography mass spectroscopy (GC-MS). Materials and methods: GC-MS Analysis was used. Results: The GC-MS Analysis revealed 25 constituents of which 12 of the compounds were identified. The major constituents were two unidentified compounds with percentage peak areas of 23.51% and 16.8%. Of the identified compounds, the outstanding in composition were 7-Tetradecenal, (Z) (peak area 9.39%), n-Hexadecanoic acid (peak area 7.12%), Oleyl Alcohol (peak area 6.15%), Phytol (peak area 5.61%), cis, cis, cis-7,10,13-Hexadecatrienal (peak area 4.26%), 2-Pentadecanol (peak area 3.93%), 9,12-Octadecadienoic acid, ethyl ester (peak area 3.21%), 1,2-Benzenedicarboxylic acid, butyl octyl ester (peak area 2.67%), and 1,E- 11,Z-13-Octadecatriene (peak area 2.15%), while the rest had less than 2% composition by peak area. Conclusion: The current study suggests that ethanolic extracts of leaves of Annona muricata are a potent therapeutic agent and paves the way for the development of several treatment regimens based on compounds from this extract. Keywords:Annona muricata, Ethanolic extracts, GC-MS, Medicinal diversity, Phytochemicals. Gavamukulya Y, Abou-Elella F, Wamunyokoli F, El-Shemy HA. 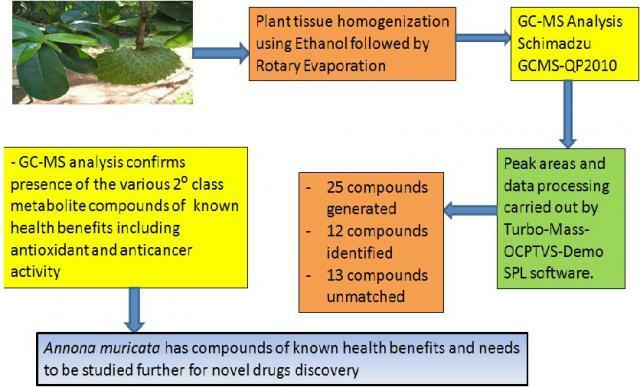 GC-MS Analysis of Bioactive Phytochemicals Present in Ethanolic Extracts of Leaves of Annona muricata: A Further Evidence for Its Medicinal Diversity. Pharmacognosy Journal. 2015;7(5):300-304.